Hello, I’m Jim Glover, That Branding Guy, for Once a Day Marketing™. On our radio show That Branding Guy™, we discussed branding and marketing with the owner of a school who teaches skateboarding safety. Joining us on the show was Joe Lehm – Founder of Santa Fe Skate School, dedicated to teaching kids safe skate boarding. John has been involved in skate boarding since 1969 and has seen the evolution of the equipment from steel and clay wheels to becoming an Olympic sport in 2020. As gear evolved so did the terrain and safety equipment. 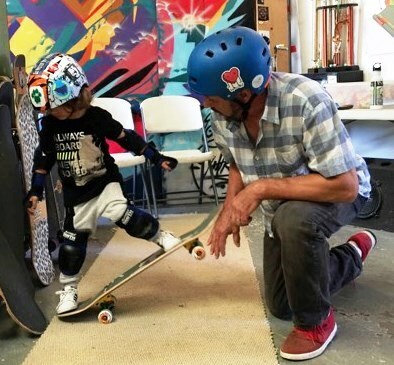 Joe was inspired to start Santa Fe Skate School in 2000 when he was enjoying the new Los Altos skate park in Albuquerque practicing skateboarding safety and wearing protective gear. There he was approached by adults and youngsters asking for advice and wanting to know how to learn safe skate boarding. This demonstrated the need for instruction in the community and Joe started the Santa Fe Skate School in Santa Fe in 2003. Santa Fe Skate School has a large teaching area with ramps and a pro shop where they build boards customized to each rider. There is also a display of antique skate boards used to teach the history of the sport that parents and grandparents (former sidewalk surfers) delight in seeing. One of the differentiator of SFSS is that Joe certifies instructors. It is generally thought that in the extreme sports participants learn on their own through practice and peer interaction. Joe finds that this omits the fundamentals of techniques essential to building strong skills. SFSS also has a curriculum that they teach in a specific order. To get the message out about Santa Fe Skate School, Joe uses Facebook and Instagram, lists SFSS under activities for kids on SantaFe.org which attracts visitors and is also listed as an activity with Meow Wolf. Joe is aware that the younger generations share their activities extensively on social media and by provide them with a great experience, this is word of mouth advertising is essential.